NAIROBI, KENYA—Warning that a complete overhaul of their skill set was necessary to survive in the 21st century, environmentalists announced a new conservation program Friday to help struggling rhinos adapt to the modern ecosystem by retraining them as urban scavengers. 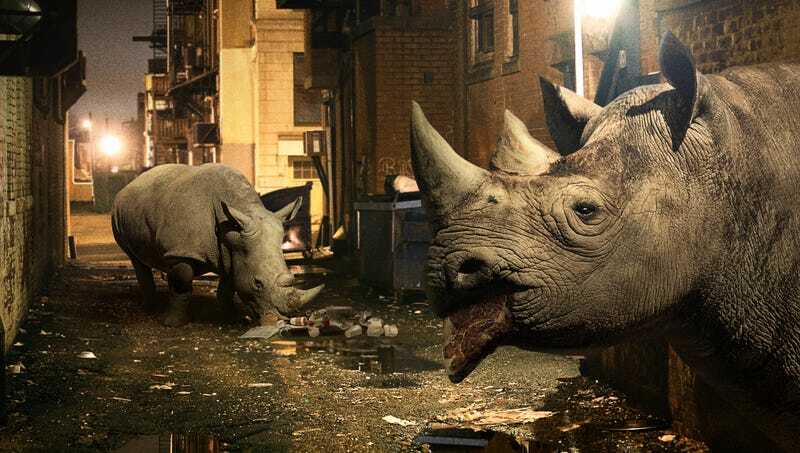 “Many of these animals simply aren’t equipped to track down a dumpster loaded with chicken bones in an urban environment, so we want to provide these rhinos with the tools to survive in a competitive modern biosphere where the old grasslands they used to rely on are rapidly disappearing,” said program leader Benjamin Duale, who claimed that opportunities for urban scavengers who can root through pizza boxes, overturn garbage cans with their horns, and gather warmth from subway vents were rapidly expanding, and the chance to thrive was there for rhinos willing to adapt their habitat and diet to the changing landscape. “We know many of these rhinos are attached to their old way of life and don’t want to give up grazing on leaves and fruit for decaying, half-eaten tacos and puddles of spilled soda, but we have confidence they can learn. Many shop owners would be happy to put out a bowl of water for a rhino, alleys provide plenty of shade, and poachers are much less common. However, they will have to learn how to dodge traffic.” Duale did note that relocating to urban areas could bring rhinos into competition with the hippos and wildebeest already vying for alleyway food sources.